Founded in 2005, the Minnesota International NGO Network (MINN) is a 501(c)(3) nonprofit organization dedicated to providing an innovative forum for international NGO and development practitioners and supporters to learn, network, and exchange professional expertise to better serve our global community. MINN operates on a very lean budget. Your tax-deductible donation of any size will help us continue to deliver relevant and rewarding programs. MINN is a community of over 1700 international practitioners and other supporters in Minnesota committed to doing global good, better. MINN boasts over a hundred unpaid volunteers who provide their services to support the MINN community throughout the year. In addition, over 200 people are card-carrying members of MINN, having purchased annual memberships in the organization and received additional benefits to MINN sponsored events and resources. 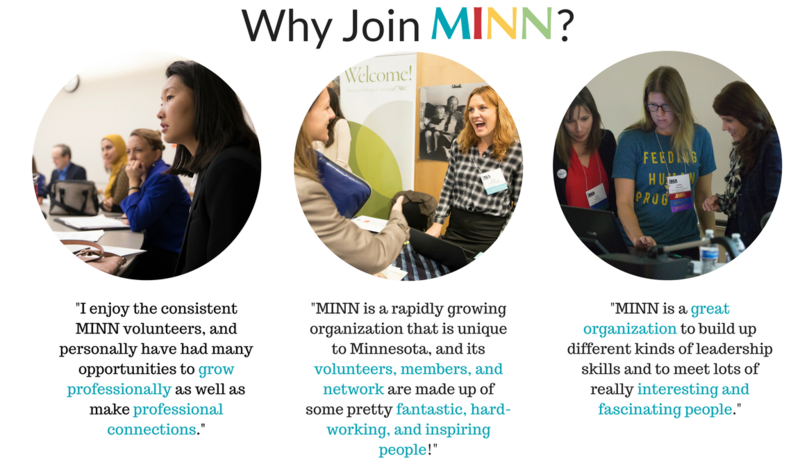 Get involved with MINN by joining one of our committees! Volunteering with the Program or Summit Planning Committees is a great way to meet fellow international practitioners, learn from your peers, and gain valuable experience. Take a look at the scope of each Committee to get started! MINN has Minnesota’s largest directory of international organizations online. Check here to see if your organization is included. If not add it.